Fed officials are about to publish new quarterly forecasts, and all eyes are going to be on where they set the job market's Goldilocks rate. Federal Reserve officials are about to publish new quarterly forecasts, and all eyes are going to be on where they set the job market’s Goldilocks rate. Fed officials in March estimated this “natural rate” of unemployment at 5% to 5.2%. Unemployment stood at 5.5% in May. A new paper by Fed board staff shakes up this view by suggesting the number could be as low as 4.3%. That has implications for the Fed policy meeting ro be held Tuesday and Wednesday. If Fed Board economists Andrew Figura and David Ratner are right, the labor market has room to run. 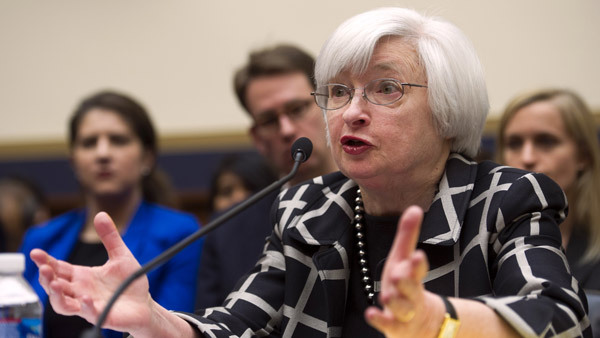 So there may be no need to raise interest rates soon, or fast. Figura and Ratner look at the question of where the full employment rate might be through the lens of labor compensation. One standout feature of the recovery is that labor’s share of the money made from production and imports is still moving sideways around the lowest levels in records dating to 1947. If the reason for that is weak bargaining power, then firms can add more jobs and drive down the unemployment rate without much wage pressure. In fact, if the share of cash going to labor versus capital isn’t changing much, it’s an incentive for firms to post job vacancies as demand rises. If a firm sees that hiring one more worker adds another $10 in sales, and the share between labor and owners stays relatively unchanged at $4 for the firm and $6 for workers, then “I am going to want to post more vacancies and add more people,” said Michael Gapen, chief U.S. economist at Barclays in New York. At least two things give the research weight. First, it tells a story that fits well with current data. Average hourly earnings for production and non-supervisory workers have averaged 2.1% growth since this expansion began in June 2009, a percentage point below the last expansion. Inflation, minus food and energy, remains low at 1.2% by the Fed’s preferred measure. Job vacancies rose the most in April in data going back to December 2000. Even if Fed officials do raise the benchmark lending rate in September, as about half the economists in a Bloomberg News survey this month expect, the research suggests the pace of tightening will be slow. “It could mean that one percentage point of tightening per year is too steep in a world where” the rate of full employment is 4.25%, Gapen said.